Hubbell Wiring Systems is excited to announce a new addition to its virtual eTour library: an interactive, 360-degree Healthcare eTour. This eTour showcases details about high-performance Hubbell Wiring Devices, Delivery Systems, and Data & Communications products. These devices can be deployed in healthcare environments to support power, data, voice, and multimedia. This hands-on, fully immersive virtual tour gives users an up-close look at nine different areas within a healthcare environment, including patient-care spaces, laboratories, diagnostic areas, parking garages, and food and laundry rooms. 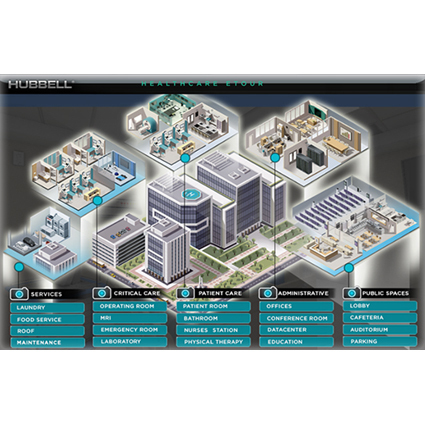 As users navigate their way through the online, 360-degree setting, they can analyze individual areas and explore the Hubbell solutions that are designed to support each aspect of a hospital. While virtually exploring the healthcare campus, users can learn more about each featured Hubbell solution. For example, within the “rooftop” area of the Healthcare eTour, visitors can choose to learn more about disconnect switches, weatherproof covers, GFCI receptacles, and watertight conduit systems by clicking on the appropriate icons. This connects them to specific information about each solution, including product benefits, features, photos, and ordering information. The Healthcare eTour can be found on the eTours page of Hubbell Wiring Device-Kellems’ website, and can be easily accessed from any desktop computer, laptop, tablet, or smartphone. To learn more, contact your Hubbell sales representative or visit www.hubbell.com/wiringdevice-kellems/en.